Victoria’s Secret fashion shows of years past herald angelic tips. “The bold colors incorporated in the past few Victoria’s Secret fashion shows––especially last year’s theme, Nomadic Adventure––inspired me. 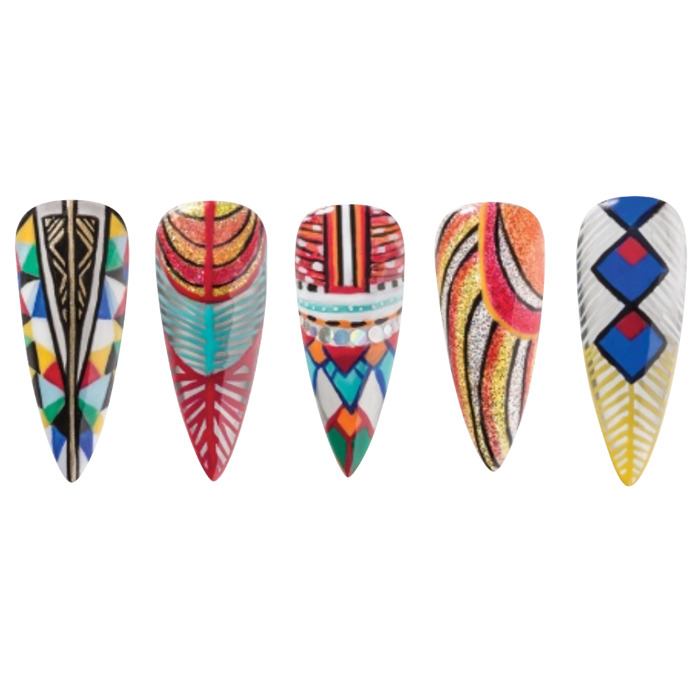 The tribal patterns and distinctive wing designs were captivating,” says Van Nuys, CA based nail artist Adriana Gutierrez. Step 1 Apply two coats of silver glitter gel polish. Step 2 Paint curved stripes with red, orange and yellow jelly polish. Step 3 Outline the stripes with black gel paint. Finish with gel top coat. Step 1 Apply one coat of sheer black gel polish. 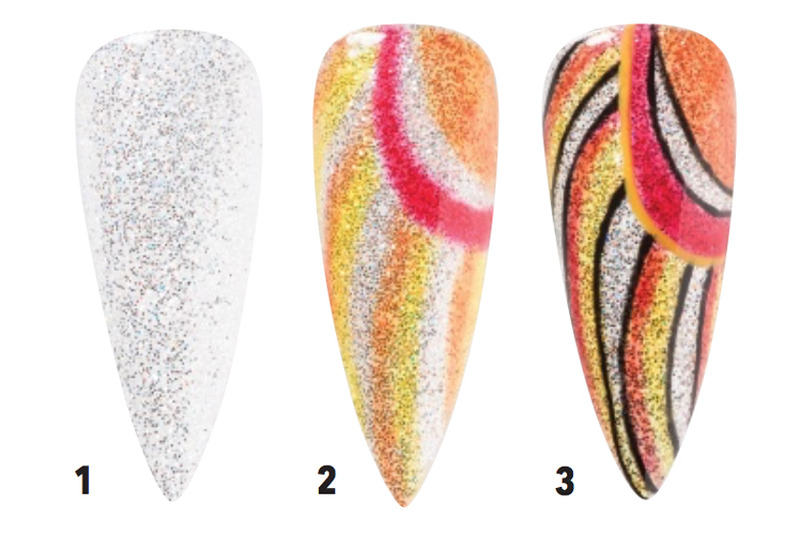 Use a flat brush to paint a deep V-shape around the perimeter of the nail with white gel, covering the sidewalls. Step 2 Use a small detail brush to fill in the white space with triangles in red, yellow, green, royal blue, light blue and black gel paint. Step 3 Paint a gold line down the center of the nail with a stripping brush. 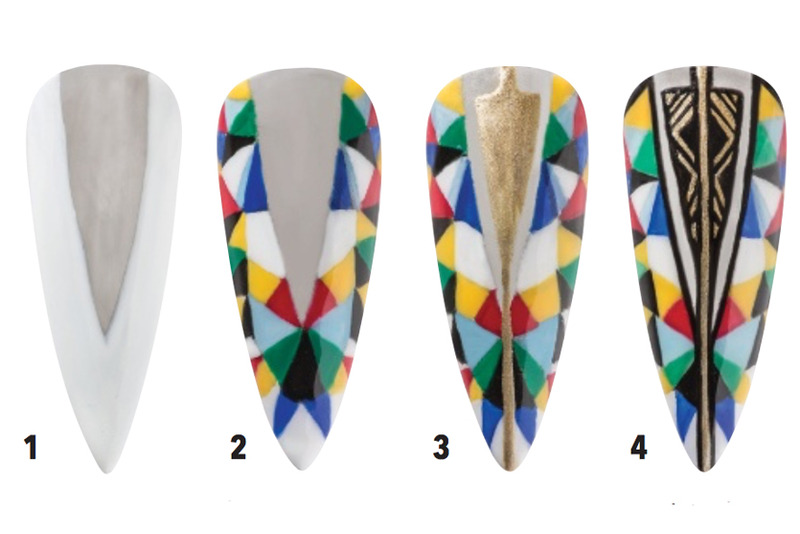 Paint a gold triangle in the center of the sheer black triangle, leaving space on all sides. Step 4 Outline the gold stripe and triangle with black gel paint. Add black lines and small triangles inside the gold shape. Finish with gel top coat. Step 1 Apply one coat of sheer black gel polish. 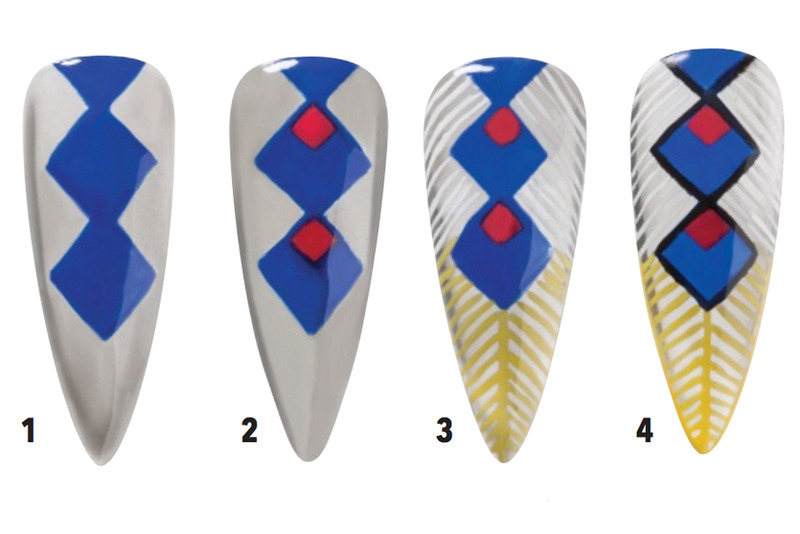 Create three diamonds down the center of the nail with blue gel paint, connecting the corners of each shape. Step 2 Paint two smaller diamonds inside the top corner of the blue shapes with red gel paint. Step 3 Use a micro detail brush to draw diagonal white lines from the cuticle to the middle of the nail. Paint a yellow line down the center of the nail starting at the bottom corner of the last blue shape. Fill in the rest of the negative space with yellow diagonal lines from the center to the free edge. Step 4 Outline the center shapes with black gel paint. Finish with gel top coat. *Cure after every gel application unless otherwise noted.